#1 - Measure the door area. Where do you want to add a door? #2 - Customize your door. Which design/stain color do you want? #3 - Fill out the form below. The form below is for orders WITHOUT installation. If you're looking for installation, please click Get a Quote. #4 - We will send you a quote and invoice. #5 - Once we receive payment, we will start constructing your door. #6 - Once completed, we will schedule local delivery or customer pick-up. 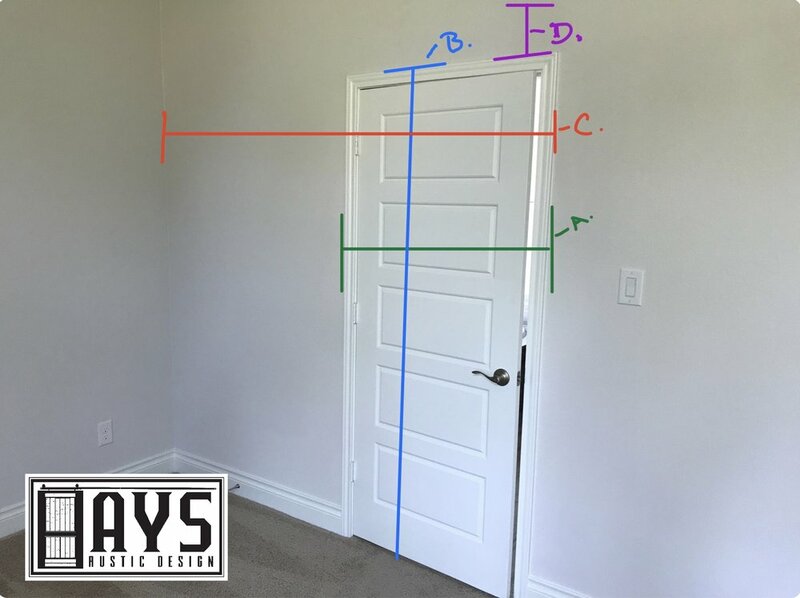 We broke down the steps so that you can easily measure for your customized door. 1)Measure the distance of A (outside edge of trim horizontal). 1) Measure the distance of B (from the floor to the top of outside edge of trim). All doors are made to order and the deposit is non-refundable after order is processed. All doors normally take 2-3 weeks but could take up to 6-8 weeks . Once delivered the customer has 30 days to report any dissatisfaction. All orders are processed via phone and email. The customer is responsible for providing the necessary details for the door - width, height, ceiling, wall space. As well as the design and color of the door. Pictures also help with the process. Hays Rustic Design is responsible if something was incorrect on our part and has the right to fix or replace the door. Contact us via phone or email to express your concerns. Hays Rustic Design is not responsible for warped/bowed doors or any damage in transit. Warping/Bowing - This occurs when the climate changes . Delivery - Someone 18 years or older must be present for delivery. It is the customers responsibility to inspect and report any damages and a signature is required upon inspection.